We are looking for people to volunteer to be on the Glenburn MWFC Fundraising & Events Group. This group will look at ways to fundraise as a whole club and to maintain room in the fundraising calendar for each team to do its own fundraising too. The group will look at ways to maximise the efforts of the club and make most of all resources available. We are looking for are people with creative ideas and are ‘doers’ and will take turns in ‘manning’ events. There has been a provisional date of the 4th July for Glenburn MWFC ‘s first Open/ Fun day so one of the first tasks will be to make this day a huge success with lots of income and fun! 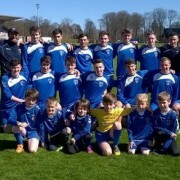 Glenburn MWFC has really grown as a club in the last few years, not only in the number of players and youth teams it has, but in terms of the awards it had received. For the Club to continue to progress and grow it really has to start focussing on fundraising on a larger scale. If you would like to get involved please get in touch by emailing us on projectofficeglenburnmwfc@gmail.com or use our contact page.